NYAUNGDON, Myanmar (Thomson Reuters Foundation) - Authorities are racing to clean contaminated water sources in flood-hit parts of Myanmar, while distributing bottled water, chlorine powder and purification tablets as they struggle with diarrhea outbreaks. Torrential rains since late June triggered floods and landslides across central and western Myanmar, killing more than 100 people and affecting 1.3 million, according to the U.N. Office for the Coordination of Humanitarian Affairs. In four hard-hit states and regions - Rakhine, Sagaing, Magway and Ayeyarwady - tens of thousands of people lack access to clean water for bathing, washing and drinking, officials and aid organizations told Myanmar Now. Ponds and wells have been contaminated by floodwaters, including seawater in coastal Rakhine state, as well as faeces from farm animals that have sought safety on embankments around ponds, officials said. "We need to pump floodwater out of these ponds. Only then can we use them to store rainwater in the remaining monsoon period," said Tin Maung Swe, secretary of the Rakhine government. "If we cannot clean the ponds in time, the locals will face drinking water scarcity in the hot season," he said, noting that about 1,000 ponds in 300 villages in his state were contaminated. Local media reported that 30 villagers were treated for acute diarrhea in Magway region's Pwintbyu township earlier this month, and 40 were treated for diarrhea last week in a village in Sagaing region, Dr Soe Lwin Nyein, of the Ministry of Health said. 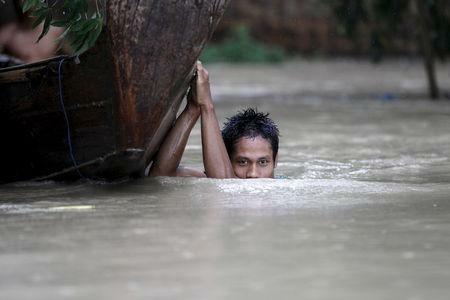 Dozens of villages around Pwintbyu suffered severe flooding, forcing residents to seek shelter in temporary camps. "In Pwintbyu, we found that there is not enough drinking water in the camps," said Lynette Lim, communications manager for Save the Children, adding that poor hygiene caused by a lack of latrines was further heightening health risks. Authorities were handing out chlorine powder packets and purification tablets, but the water in many ponds and wells in Rakhine was brackish and could not be treated, local government spokesman Hla Thein said. Authorities and aid agencies have begun to empty and clean ponds and wells across the country. In Rakhine, the International Committee of the Red Cross is focusing on installing rainwater collection systems. In Nyaungdon township in the Ayeyarwady delta region, an official at a displacement camp said 200 villages in the area faced an acute drinking water shortage. Hundreds of people at the camp, living on bamboo platforms raised above the floodwaters, were relying on donations of bottled water.